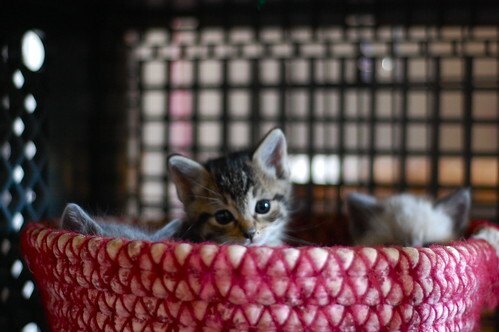 The Itty Bitty Kitty Committee: It's Squueeeebe-Phoebe!!! As promised, I've got a little Phoebe Dearborn update for you today. 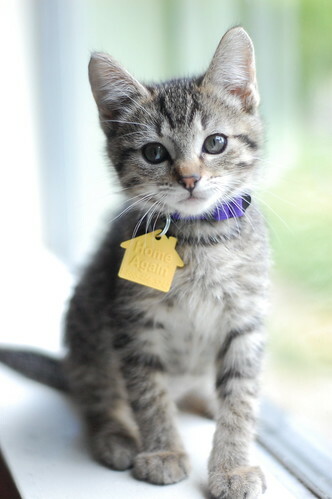 For the newbies in the crowd, I want to direct you to our introduction to this tiny tabby. She has a pretty amazing story. Click HERE to give it a read. Here's Miss Phoebe on the day she moved in with us. Here she is on the day she left our nest. And here she is today!!! What a lovely young lady she is! So sleek and beautiful!! According her mom, Amy, she's the more cautious of the pair, but very, very loving. Finally, a sweet picture of the girls all cuddle up together. They are such a joy and we love them so much! We really believe we have the best kitties ever! They love and play with each other constantly. We truly believe that they were always meant to be ours! Thank you again, Amy, for the sweet photos and updates on your girls. We think they were meant to be yours, too. We're thrilled they bring so much joy into your lives. Oh, how elegant she's turned out to be! Simply lovely. she certainly has come a long way....and is a very lovely young lady! I'm so happy this little one has such a loving home. The Dearborns are one of the best batch of kittens ever! I can not believe how much they continue to touch my heart. wow she is so awesome, she is stunning, i can see her hunting in the african jungle! a true cat! So gorgeous! And it seems like they both have extra-long tails. Hello our mama reads this blog a long time and loves the kitties here. So glad to read f/u stories of the kitties after they leave for their furever homes. Click here to give it a read does not work for me. Anywhere else to see it? Want the story please. What a sweet adorable kittie - and the pair of them together... awwwwww! Might we have an update on Marla Dearborn? 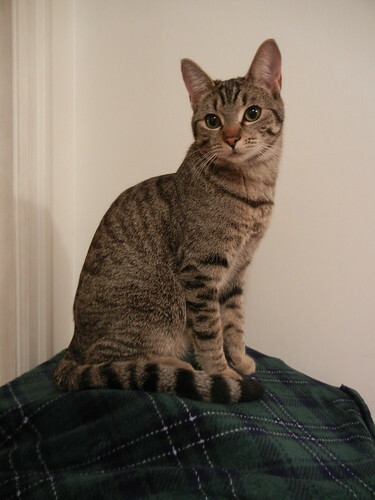 Aww I had such a soft spot for Phoebe - those tabbies, and apparently I still do - she is stunning and so regal. I might be a bit cautious too if the last time I went off exploring on my own I came back to find my siblings gone. I am so very thankful that man went back since obviously Phoebe and Ms G were meant to be together with Amy. Another little beauty, you must be so proud. oh she's so stunning! Wow she was soooo little when she left. 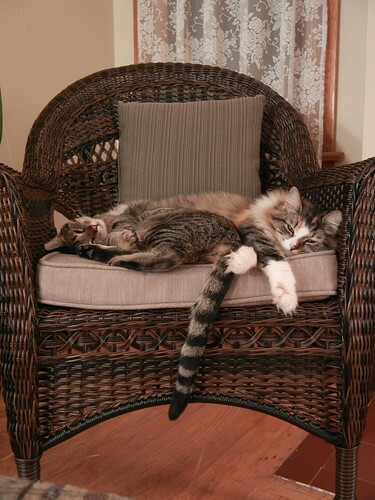 In the picture of the two of them together her tail looks 10 feet long! ;) Very cute! Phoebe grew up to be soooo beautiful! Love her bright and shiny eyes. And that picture of the two girls snuggling. Oh my goodness. Squee! Phoebe is gorgeous! She looks so sure of herself too, so I know she's loved. Phoebe is a gorgeous lady cat now! Oh my goodness, Phoebe and Geraldine are in kitty heaven. Aww, shy little Pheobe, look at you now! It's good you two girls have each other. thanks for the update. Pretty Phoebe!!! What a beautiful, happy pair. I love Geraldine's toe floof! This is a lovely Valentine's Day present. Thank You!!!! She's still an adolescent cat, you can tell - all ears and tail. A sleek and beautiful lady. Laurie, did Amy decide to keep their ibkc names? When I asked our boys if they wanted to change their names they looked at me as if I was crazy--they already had the purrfect names! So they are and will always be Miss Geraldine Dearborn and Miss Phoebe Dearborn to us and all!! I can't believe how fabulous their tails are. xoxoxoxoxo *heart* yay!!!! Phoebe and Geraldine are sooo sweet together! As others have said above, both Phoebe and Geraldine have grown up gorgeous with extraordinary tails/tales in the loving care of their forever home. I also couldn't help but squeeing at (I think) Pearla's and Sheldon's ears accompanying Squeebee Phoebe in the bottomless pink basket. Oh my goodness, they are both so beautiful! It is great to see them now grown. Amy, I can tell you've done a wonderful job raising these two precious girls, and thanks for sharing the updated photos of them. What a treat! Little Miss Phoebe is growing up to be a true beauty! Sigh...her story always brings a tear to my eye (of gratitude for that lovely man who wanted to be sure he'd found ALL the babies) and a smile to my face of sheer happiness at how lucky she is to have such a wonderful life now after such a rough start. You're doing a wonderful job with these girls, Amy -- thank you SO much for the update (and the photos)! Thank you for sharing these pictures with us Laurie and Amy. Phoebe has grown into such a beauty--with such a magnificent tail. I am so pleased these sisters are together forever. Like Laura and others, I am just so pleased that man was kind and conscientious enough to go back and rescue this dear little girl. Hahaha, so I'm not the only one who noticed their fabulous tails!